Harrell's work combines pop culture, innocence, friendship, and some of the seamier side of the circus background that only adults can appreciate. Come one! Come all . 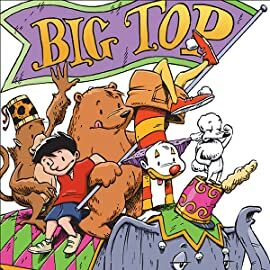 . . to the exciting world of Big Top! 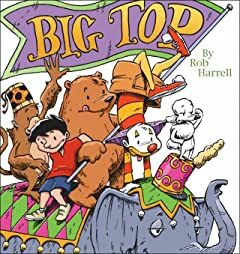 Rob Harrell's three-ring comic strip has already packed the house with fans eager for his hilarious take on the circus and those who bring it to life. The circus and its colorful cast -- led by 10-year-old Pete and his happily reformed performing bear, Wink -- are a perfect metaphor for life. It's not always what happens on the surface, Big Top reminds us, but what takes place backstage that delivers the lessons and the humor. Pete and Wink keep plenty of odd company, including Kingston, coolest king of the jungle; Stucco, a mute clown who still manages to make his point; Manfred, the bookish monkey; Dusty, the wisecracking tell-it-like-it-is trained poodle; Andrea, the new acrobat girl who's caught Pete's eye; and Hairy Mary the Bearded Lady, a mother figure to them all. Take this crew on the road and you get an endless array of situations and relationships, care and impatience, honesty and intolerance. It's like one big Big Top family . . . one that welcomes all readers for the mere price of a ticket.